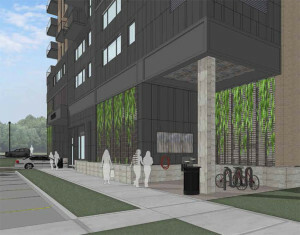 Bower says they want to create a project that stands the test of time by creating the most bike-friendly development in the city with a big investment in co-working space, a strong connection to the bike path, bike lockers in each living unit, water capture systems for the rooftop gardens, and infrastructure for eventual rooftop solar panels. The mostly brick exterior building will have plenty of glass as well as metal accents. 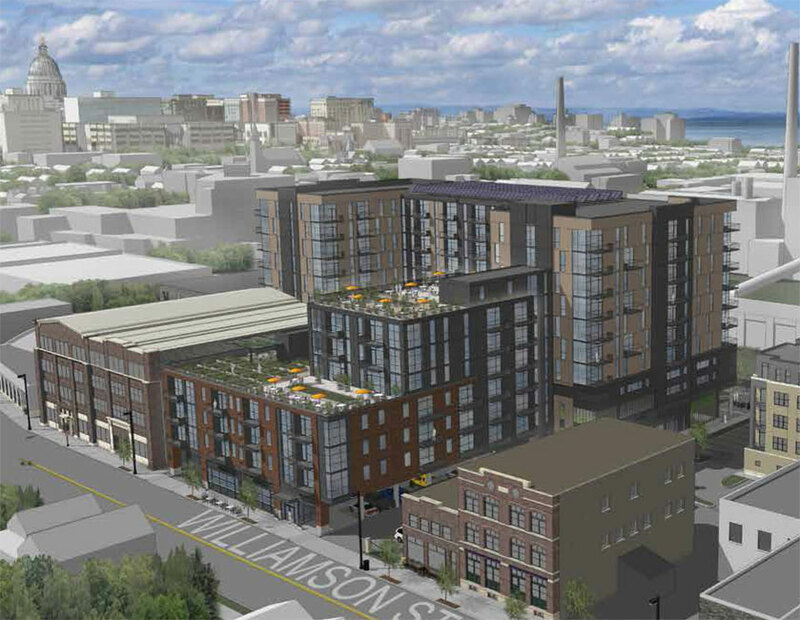 Four stories will sit on Williamson Street and align height-wise with the Olds building to the west and the Madison Candy Company building to the east. The face of the building will be articulated with balconies on the top three floors and retail or restaurant space on the ground floors. The first tower, which extends up an additional three stories, is set back 40 feet from Williamson, which Bower notes is ten feet further than what is required in the Willy BUILD plan and which he says is to “give Williamson Street the credit it’s due”. The ten-story tower will stretch east-west along the rear of the property in the shape of a three-sided rectangle facing south and sit atop a four-story parking deck with one level underground. Baldwin Development says 172 of the 336 parking stalls will likely be available after 5 p.m. for neighborhood use at hourly parking rates. Bower says that they are currently planning four residential unit offerings: a very efficient one-bedroom, a larger one-bedroom, a two-bedroom and a three-bedroom. Twenty-six units will be available for affordable housing applicants based on 60 percent of Dane County median income ($61,913) with the rest of the units being offered at market rates. 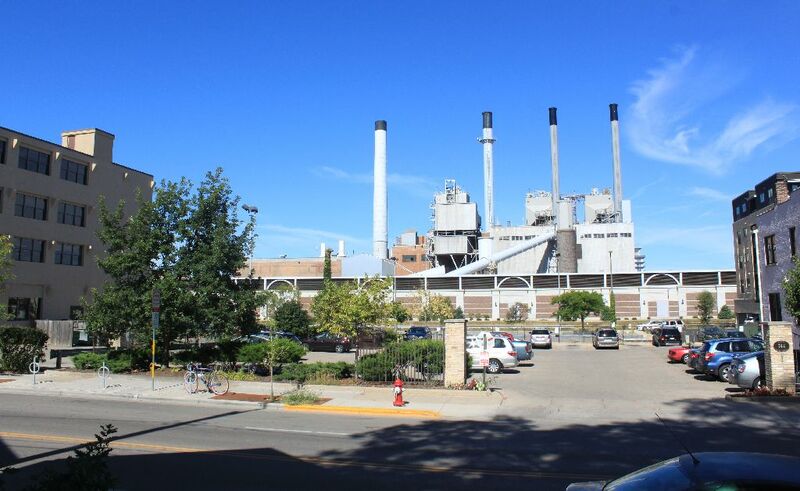 Bower says that the project could not go forward without the cooperation of John Martens, who owns the Madison Candy Company building that currently hosts Ground Zero Coffee and the Eldorado Grill. 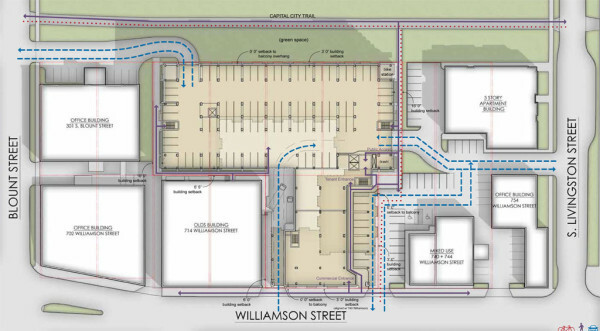 Martens has agreed to turn over two-thirds of his parking lot to allow a marked bike path to flow through the lot connecting Williamson with the Capital City Trail. Martens, a longtime area property owner who first lived on Willy Street when he “crashed” in an apartment above Dolly’s Cafe (now St. Vincent de Paul) in 1969, for years has been deeply engaged in determining how the neighborhood has and should evolve. Martens added that he thought the height of the ten-story structure would be absorbed by the Madison Gas & Electric plant behind it to the north, which, combined with its stacks, towers at least another 100 feet into the air. While Martens has a vested interest in any new development succeeding next door, the traffic flow around the site could be challenging. There will be two entrances on Williamson, one on South Livingston, and one on South Blount. 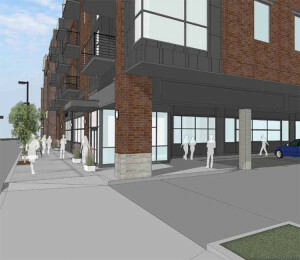 The Livingston entrance will pass between the Wisconsin Council for the Blind & Visually Impaired at 754 Williamson Street and the recently built Livingston Place apartments. Cars entering from the east off of Livingston will have the option to proceed on a mostly straight path into the parking structure or zig-zag left and right, eventually arriving in the shared parking area with Ground Zero. The western entrance off Williamson will provide a straight path to the parking structure, but will have to contend with commercial trucks from time to time using a loading dock on the east side of the Olds building. 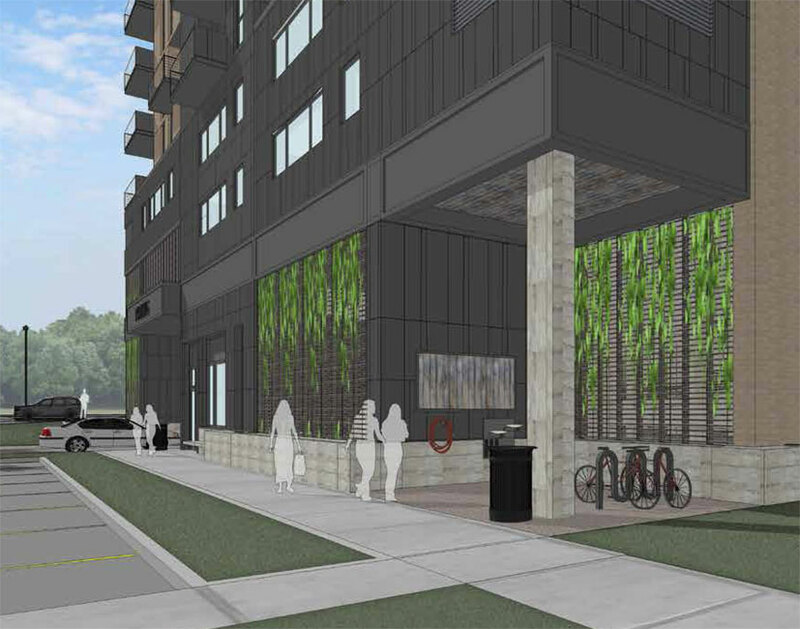 Baldwin Development hopes that most of the users of the complex will use the entrance off Blount which would feature a long driveway passing behind 301 South Blount [housing Google’s Madison office] and then entering the parking structure. During an August presentation before the MNA P&D committee, member John Coleman raised concerns about how much green space the driveway along the bike trail would reclaim. Bower said that they had been working with the City of Madison Traffic Engineering Department to design the entrance, which would eliminate some parking stalls behind Google but would net 900 square feet of green space. Expanding on the bike friendly theme, Bower said they were considering a water fountain and bottle filling station along with compressed air adjacent to the Blount entrance. Following the August P&D meeting, which was the second presentation to the committee, Marsha Rummel held a community meeting September 9 to allow Baldwin Development to present its plans to the community. Reaction was mixed as the discussion continued on the MNA listerv. 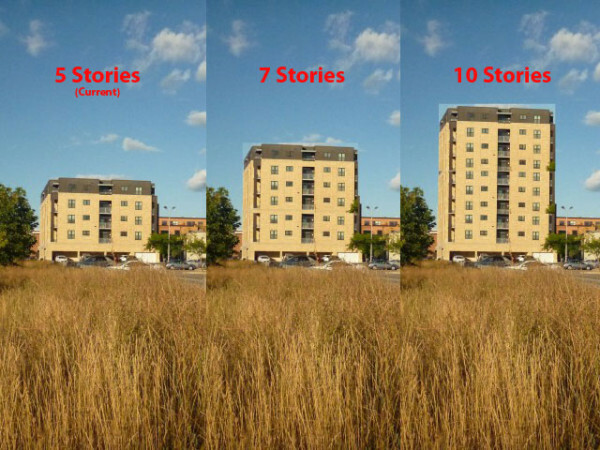 While both supporters and detractors had quibbles with various design aspects, the height of the ten-story portion of the development received the most attention. Those opposed to the project were very concerned that the height would denigrate the character of the neighborhood and that the project violated the basic tenets of Willy BUILD plan. “It is completely out of character with the neighborhood and sets a precedent that is unlikely to help preserve the character of the businesses and homes that has been developed over recent decades,” resident Lucy Mathiak wrote on the MNA listerv. “The ten stories will affect everything from sunlight to traffic density in an already congested area, ” she continued. Another poster, “Linda”, encapsulated many of the complaints about the project: that the P&D Committee, in offering its recommendation to the MNA Board, should primarily heed the Willy BUILD plan, which was adopted by the City Council. She questioned whether the developer truly qualified for the additional floor bonuses through such things as affordable housing. John Coleman also noted through the online neighborhood conversation that the development as currently proposed may have run afoul of the East Rail Corridor Plan as well as two zoning areas that cover the property. 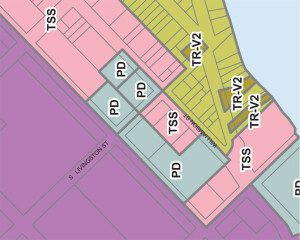 Coleman says the development may not comply with the TSS (Traditional Shopping Street) zone but the PD (Planned Development District) is much more open. MNA P&D Member John Coleman provided to the MNA listserv three images of Livingston Place apartments, altered to show how a current structure would appear on the skyline with additional stories. They are combined here, with labels added, for comparison. “City staff have advised that a PD is the most appropriate path for the project (vs TSS). So this is the direction we will be going, ” Bower wrote when asked by Willy Street Blog to respond to the zoning issue raised by Coleman. Jim Bower is no stranger to public sector development heading up the Commercial and Industrial Development section for the City of Chicago and managing the Brownfields Program for the Environmental Protection Agency. In 2010, Jim’s Bower Group was hired by the City of Madison to help market the Capitol East District (changed by Bower and other consultants from the Capital Gateway Corridor Plan) to attract more developers. Others posters to the listserv agreed that the BUILD plan is an important guiding document but it is malleable and should evolve over time. Many who indicated various levels of support for the project felt that the P&D Committee has more latitude to accept various projects that would truly benefit the neighborhood. “Ambiance, aesthetics, and individual notions of character are meaningful in place making. But in advocating for these preferences, please don’t forget what is needed for our local economy to support the families that take the risks in running these businesses,” wrote Tom Christensen, a past president of the Greater Williamson Area Business Association (GWABA). Each block in the Williamson Street BUILD Program II plan has zones that govern its future development or revitalization. “All of this is connected, and small businesses do still need more customers, and preferably local customers. 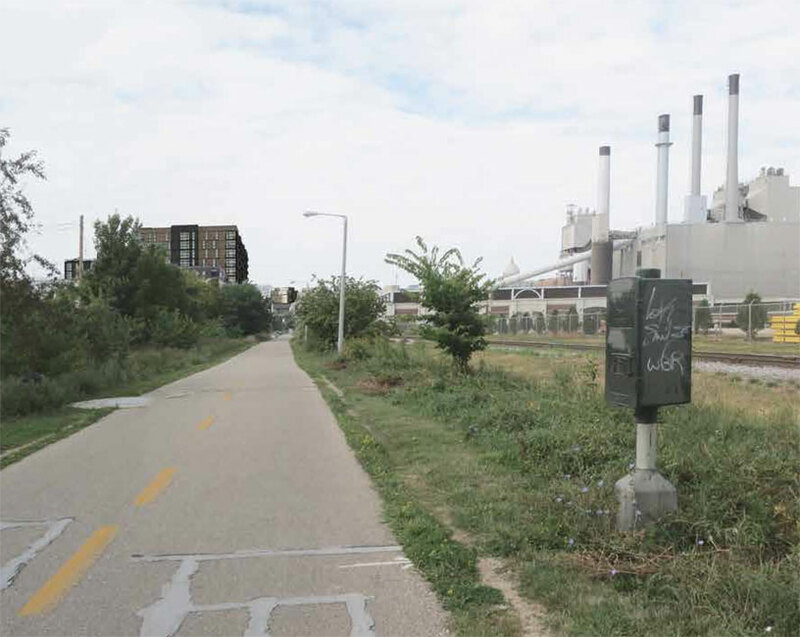 Concentrating new residents at the bike path seems a fair compromise to these two unnecessarily competing preferences,” Christensen continued. Current GWABA President David Lohrentz, who attended the August P&D meeting, tells Willy Street Blog that his association met this past week, and arrived at the conclusion that this development would be more the exception than the rule. “We are willing to support the ten stories in this case because the height is in the back of the block, stepped down to an appropriate height, is on the north side of Willy St, and is backed up to the MG&E plant. We don’t see this as setting a precedent because very few sites (if any) would have the same characteristics as this one,” Lohrentz wrote in an e-mail. 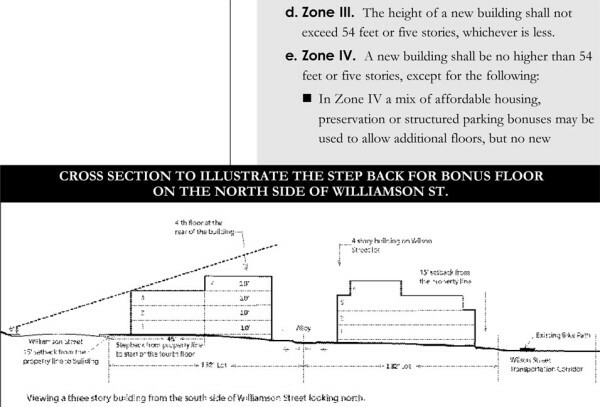 The guidelines for Zone III and IV from the Willy BUILD II plan. Lohrentz added that the additional entrances on the other streets would reduce traffic on Willy Street, noting that currently lot users can only enter and exit on Williamson. Baldwin Development Group, in building the project, is targeting the untethered worker by hoping to offer at least one floor for co-working space, which provides live-work-play all in the same place – something it seems the neighborhood already provides, albeit spread over several blocks. 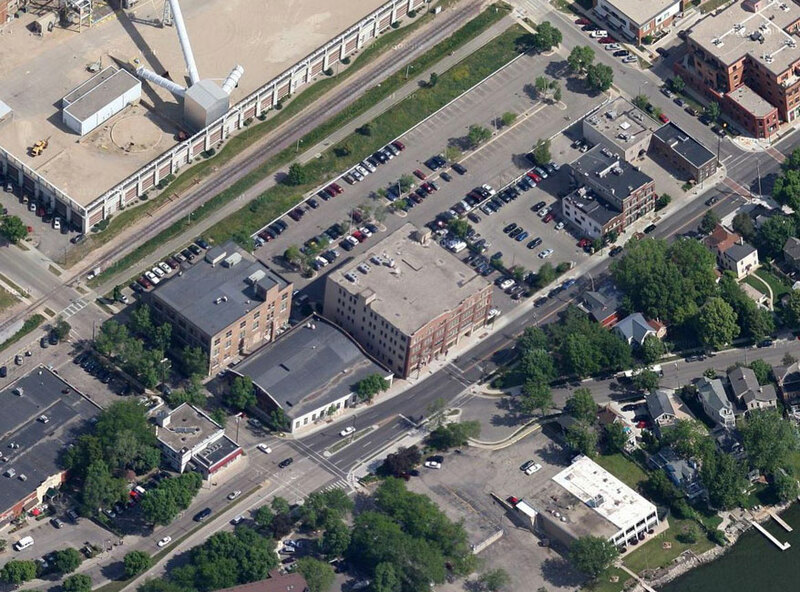 For developers, in order to solve the parking woes, often structured parking is the only option; however, that can run $26,000 per stall, an estimate used in proposals to the City during the Block 800 competition. To offset these costs, more residential and commercial units are needed to make the project financially viable, and that usually means going vertical. While Bower said the setback of the tallest tower against the MG&E plant is an attempt to eliminate the experience of height on Williamson, they could reduce the parking levels, but he cautioned that doing so would reduce availability and force more people to find options on the street. P&D Committee Member Joshua Clements has been open in his support of the project both at the August meeting and online, posting several detailed point-by-point analyses of what was good and what needed to be improved. “I am in strong support for this project, with suggestions for improvement. I support the conceptual design, mix of uses, and height. My concerns are primarily focused on design and materials,” Clements wrote. 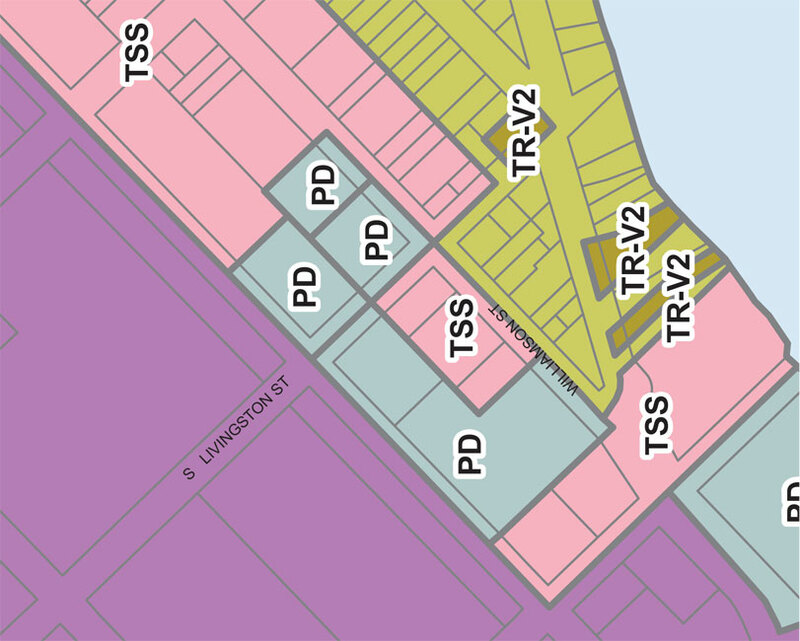 While both TSS and PD Zoning districts appear to apply to the site; Bower says after consulting with the city, Baldwin Development will request zoning under PD . “This development fits a reasonable number of residential units into a mixed-use development, and height is required to do that. Late Sunday evening, (September 15) P&D Chairman Lindsey Lee, Owner of Ground Zero Coffee and a resident directly across the street the potential development, publicly supported the project by posting a lengthy letter on the MNA listserv signed by himself and his wife Beth Rosen. How the site currently looks today adjacent the Lee residence. Surface parking lots and the MG&E power plant are the primary features. As with all neighborhood input, recommendations are passed up the chain. The P&D Committee will meet on Wednesday, September 18 at 8:00 a.m. at the Wil-Mar Neighborhood Center (953 Jenifer Street) to discuss and vote on a recommendation to the MNA Board. The MNA Board will take up the recommendation during its monthly meeting Thursday, September 19 at 7 p.m. at the Wil-Mar Neighborhood Center. Board President Michael Jacob has announced that Baldwin Development Group will make a presentation followed by Q & A and input from attendees and discussion by the board. The Board can decide to accept, modify, or reject the recommendation, and will forward it to the City of Madison, which has the only legal authority over the approval of the project. While not binding, the City usually gives appreciable deference to neighborhood input. Whether you are tethered or untethered, scared of heights or can leap ten-story apartment towers in a single bound, the MNA would likely appreciate your input. Update II [9/18/2013]: Updates Dane County median household income per U.S. Census figures. This entry was posted in Madison, Madison Commentary, Willy Street, Willy Street Commentary and tagged 2008 Capitol Better Urban Infill Development (BUILD) Plan, 722 Williamson Street, Baldwin Development Group, Blount Street, City of Madison, David Lohrentz, Greater Williamson Business Association, Ground Zero Coffee, Jim Bower, Lindsey Lee, Livingston Street, LLC., Marquette Neighborhood Association, Marsha Rummel, Marty Rifkin, MG&E, Preservation & Development Committee, The Eldorado Grill, The Olds Building, The Rifkin Group, Wil-Mar Neighborhood Center, Williamson Associates, Williamson BUILD Program II, Williamson street by TheEastSider. Bookmark the permalink. Thanks for the thoughtful, fair-minded summary. It will certainly be an interesting process trying to balance density, aesthetics, neighborhood needs and the nerves that accompany unforeseen changes. This proposal is appropriate. Lower elevation on Willy St. and higher elevation on the bike path is a good way to design for this parcel. It adds density on an appropriate parcel while being sensitive to the scale of Willy St. Hold the developer’s feet to the fire in demanding thoughtful, high-quality design and materials. David Lohrentz is right that they should be encouraged to make it a “future landmark” design. This proposal should absolutely not be endorsed by MNA if it neglects or presents a “backside” to the bike path. The bike path along Willy should be treated as a urban transportation corridor just like any other. Its usage is increasing (literally hundreds of riders use it every day in either direction), and it would be a regrettable mistake to neglect that as usage increases. Also, to say that this project wouldn’t set a precedent is naive. Every project that gets built is perceived (at some point) as a precedent for future projects proposed under similar conditions. Of course this will set a precedent. Hopefully a great one. Willy Street Blog has quickly become a great resource for the near east side and beyond. Great balanced reporting Fareed. I agree with Jason Tish’s comments. We as a neighborhood have work to do to make sure this is a great addition to neighborhood. Traffic is the big issue for me: how much more will this 10-story building bring in? parking – where and for whom? will tenants and visitors be encouraged to use East Washington Avenue? will Willy Street be widened? how much traffic rumbling can the Isthmus streets take? The ideal situation is actually a traffic jam. Seriously. I’m not kidding. The only way to reduce the use of automobiles is to let it become inconvenient to use them. Instead of making our roads more efficient for cars, lets make them less efficient for cars, and more efficient for mass transit, bicycles, and pedestrians. Our ultimate goal should be, and eventually will be: mass transit, bicycles, and walking. No need for cars, and no desire to own one. We won’t desire to own one because parking is expensive, cars are expensive, in a few months fuel will be expensive again, cars are an extremely inefficient use of energy, and with more population density in buildings like these, a grocery store might be able to stay in business nearby which we could all walk to. How great would that be? It is the future; we might as well start now. Interesting that there are no comments from occupants of Olds Building or Harvester Building where hundreds of state workers are in jeopardy of losing parking and putting up with noise, dust and congestion of new construction. Parking is already difficult and would be problematic in the extreme during construction. We have only recently lost parking places due to Livingston Place Apts. and dealing with those construction issues. Speaking for myself as well as colleagues, we are opposed to this new plan. Why are we not seeing input from administrators of state programs housed in these buildings? Just received a Facebook message from a worker in the Olds building (and former HS classmate of mine). The only comment was interest since they had heard rumblings of a project but was not sure what was happening. EastSider, that is one thoroughly researched and well-written blog! Also nicely illustrated and spot-on accurate, with only one tiny exception: that was not the “Dolly Madison restaurant” that I “crashed” above back in ’69, but the much-missed Dolly’s cafe, frequented by Lily Tomlin, Tom Waits and many other genuine characters in its bohemian heyday. Willy Street has always been abundant with real-world culture, and I for one hope that its tradition of toleration, diversity before it had a name, and authenticity will carry forward. Thanks John. The post has been updated to reflect the correct information. Both my husband and I are against such a large development in the Marquette neighborhood. We do not feel it is in character with the neighborhood aesthetically (too tall), it increases the density of the neighborhood, increasing traffic, parking issues, etc. We do not feel there is s glut of housing in the area. On the contrary with developments going up on East Washington and recent housing developments in the neighborhood already. We would rather see the renovation of old houses in the hood and more green areas and open air – not obstruction of blue skies.